Staying true to tradition, Paris Saint-Germain’s new 2018-19 home kit bristles with the historic red and blue cherished by the club’s fans. And the shirt is absolutely flames! Enjoy. Those who flock to the Parc Des Princes create one of world football’s most famous atmospheres, characterized by a deafening din on match days, which provided the creative spark for designers to run PSG’s famed vertical red stripe through a speed filter and thus create a visual effect similar to a sound wave. “The PSG fans are some of the noisiest in Europe and this powerful concept allowed us to do something new with the red stripe. It’s a really fresh and unique approach, but when you look at the kit you instantly recognize PSG,” says Pete Hoppins, Nike Football Apparel Senior Design Director. Rich in PSG heritage, the result is a kit designed to please to both fans and players alike. "Every time I enter the locker room, discovering my jersey with my name on the back is always a great source of pride. And when I go out on the pitch, I feel the strength of the fans. They push us to surpass ourselves,” says midfielder Marco Verratti. And honestly, the shirt is also pleasing us. One of the best kits of the year so far, and we really can't wait to watch Mbappé and Neymar (if he hasn't left by then) score goal after goal after goal in this beauty. It looks like the perfect addition for your pitch and street game! 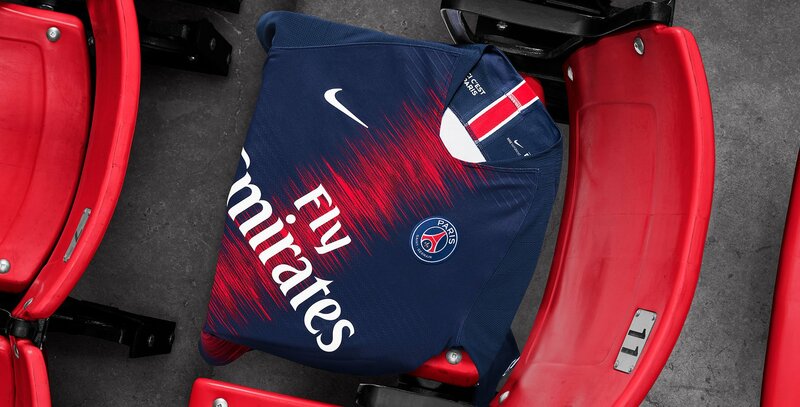 The 2018-19 Paris Saint-Germain home kit will be available May 12 right here.